Pages 230/231: I can't say for sure if we'll ever know that answer to whether my daughter is alive or not. I know it doesn't look good. But just as that old metal spiral staircase rose from the ashes when our lake house burned down, so too faith stands strong in the remains of this devastating loss. And just as my Dad built another house around that staircase, I will build another life around hope and faith. It won't ever be the same. But I pray that it will, at the very least, be useful. The hope that filled Natalee's heart fills mine, and I will press on. Faith got me up this morning, and faith will see me through tomorrow. And the next day. And the next. Kesse; Bible and Freeman NEW! Page 23: Rested and refreshed, we leave Memphis late Monday morning with Linda driving and Marilyn up front with her. I take the backseat. We sail along, chatting like we alway do, talking about our plans for another road trip one day soon. Marilyn and I are happily speculating about what our daughters' reactions will be when they open their presents to find a set of extraordinary Wizard of Oz figures. Natalee will gasp with excitement when she sees these. Before we know it, we've crossed over into Mississippi. Somewhere amid our conversation, between the chuckles and the small talk, my cell phone rings. I don't recognize the number, but answer it anyway, which I usually don't do. It's a young girl. "Mrs. Twitty? My mom ... umm ... my mom, she umm ... wants to talk to you." It's the daughter of Judi, the travel agent. She developed appendicitis right before the trip, so she and Jodi didn't get to go to Aruba. They are in Birmingham. It seems like an eternity before Jodi takes the phone. "Tell me what's going on," I say in a voice much firmer than the one I usually hear coming from my mouth. She simply says, "Natalee didn't show up this morning to get on the plane." And instantly I know. It's more than a mother's intuition. It's certainty. Something terrible has happened. I have just answered the proverbial dreaded phone call that no mother or father every wants to receive. The one we fear from the moment our children are born. The one that changes a parent's life forever. Please delete post #640. I messed up the highlighting. America with what is seen in Castro Castro, the federal prison system is much more advanced, the prisoners have more benefits and is more organized, "he added. He reported that Van der Sloot will demand that the Chilean State because it was "expelled" from this country without respecting their civil rights. As stated, the defendant will prosecute the Chilean authorities were in charge of the extradition process, which should have lasted about six months, "but was expelled from the country in a way that violated their civil rights. I laughed first, and then I got mad. Stephany Flores had rights too, until she met that murdering monster piece of chit. He didn't enter Chile legally, he intentionally fled there to avoid prosecution and IMO he shouldn't have the expectation of any rights! I hope if the POS lives long enough to eventually be handed over to the United States that he'll be charged with the murder of Natalee Holloway as well. It's all a game to get him out of Peru as soon as possible. I hope he dies there. It would save the U. S. a lot of money doing what Aruba should have done almost six years ago. And all of Aruba's whining about Natalee's case putting them in a "bad light"? Well just wait until the U. S. is having to deal with him and his monster mother's antics. Aruba ain't seen nothing yet! Good luck with that. I hope the Sloot fund spends a lot trying. I hear the new lawyer can use the money. Joren van der Sloot is officially handed over to INTERPOL Lima officers by Chilean police. Van der Sloot's arrest was down to co-operation between INTERPOL Chile and Peru. Joran van der Sloot, aged 22, was expelled to Lima on Friday after being taken into custody by Chilean police the previous day in the coastal town of Vina del Mar after INTERPOL Peru alerted the international law enforcement community that he was wanted in connection with the death of 21-year-old Stephany Flores Ramirez, whose body was found in a Lima hotel room on Wednesday 2 June. “This case is a perfect example of international police co-operation in combining collaboration and action by INTERPOL National Central Bureaus on the ground and the ability for these to instantly share and communicate information on wanted persons by our Command and Co-ordination Centre and Fugitive Unit at our Lyon headquarters,” said INTERPOL Secretary General Ronald K. Noble. “Van der Sloot’s arrest is a credit to law enforcement authorities in Chile and Peru and once again demonstrates the power and effectiveness of international co-operation between police in obtaining information to identify, locate and apprehend fugitives around the world,” added Mr Noble. In a separate case, Van der Sloot remains a named suspect by authorities in Aruba in the disappearance on the Caribbean island of 18-year-old US citizen Natalee Holloway on 30 May, 2005. INTERPOL issued an international missing persons alert (Yellow Notice) for the teenager following her disappearance, which still remains valid. Van der Sloot was arrested but never charged over her disappearance. However, he faces an arrest warrant by US authorities in Alabama on charges of extortion and wire fraud linked to that case. during evento at nikky beach, ladronnan owing to probecha break enter steal beverage of barefoot diadomingo morning owing to enter informe of kiebro y ladronicia at barefoot, at once owing to dirigi one patrol at the sitio. at arrival of the patrol owing to come compronde cu during madruga hour cu was have one evento at nikky beach some person owing to fly enter the lugar forza cooler y sit drink beer y wine y after bay cu some beverage also. owing to solicita presencia of the investigadornan tecnico for come analiza the vingerprintnan for so captura the ladronnan. diadomingo madruga if malhechornan owing to burla of autoridad, while cu polisnan cu refuerzo owing to bay atende problem in oude molen pafo malhechornan owing to bore 7 tire of autonan of police. criminalidad owing to escala dimas end y still not have none gobernante y niether none member of parliament cu can owing to come cu one sugerencia of cambio of ley of castigo neither for change the sistema of the institute correccional. because esakinan do not help cu nothing. encambio this is give the criminalnan y malhechornan more power for follow abusa y burla of autoridad. have to come one cambio in we sistema judicial. come on parlamentarionan, come on ministernan y also ministerio publico haci algo before is late. so here criminalnan is burla y mine we unique salbacion for justicia. look at cuanto the people here is sufriendo all day, cu tanto chollernan, hortamento, kiebro cu ladronicia, destruccion, joyriding, hortamento of car, atraco, maltrato, abuse sexual, hinkamento, tiramento y even matamento. then now destruccion at autonan policial. what you is keep? Another attempted suicide yesterday...by drinking paint thinner! saturday afternoon owing to enter informe of cu one person owing to try place end at his life at tamarijn bebiendo (drinking) thinner, at once owing to dirigi tanto police because; ambulance at the sitio. at arrival of the patrol owing to come constata one man throw abao y was saca while one holor enough strong of thinner was leave for of his respiration. at the momentonan ey also ambulance owing to arrive y owing to inicia cu first help y after owing to transporte cu urgencia for hospital. we owing to succeed achieve one interview cu esnan cu owing to descubri the victima here. If that's a pack of cigarettes, between the seats, it could explain all those car fires. For those who don't have Lifetime, or maybe missed these episodes! 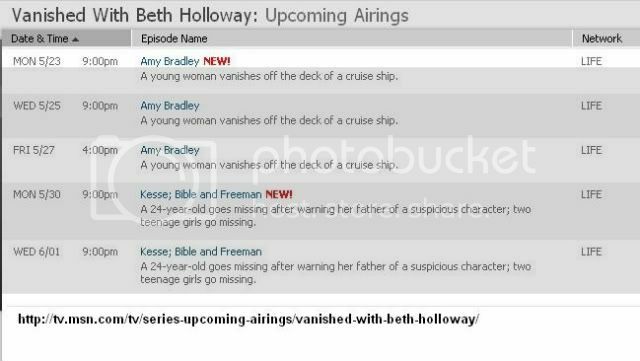 Season 1: Episode 1 (Holloway/McStay): Original air date: 5/09/11. Set in Aruba and Fallbrook, CA. Beth Holloway shares her journey to find answers about her missing daughter Natalee and begins her quest to help families with loved ones who have vanished without a trace. The episode also introduces California family of four, the McStays, who all suddenly vanished without a trace. Learn more about Natalee, Beth, and what you can do if someone you love goes missing with "Vanished" safety tips, resources, photos and more. Season 1: Episode 2 (Grinstead/Lunsford): Original air date: 5/16/11. Set in Homosassa, FL and Ocilla, GA. Viewers meet the family of a 10-year-old girl who went missing from her Florida home and her father embarks on a journey to clear his family name and bring a killer to justice. Additionally, Beth visits the loved ones of a high school teacher and former beauty queen who vanished from her home late one night. Learn more about Natalee, Beth, and what you can do if someone you love goes missing with "Vanished" safety tips, resources, photos and more. Watch the full Lifetime movie "Justice for Natalee," starring Tracy Pollan and Stephen Amell. 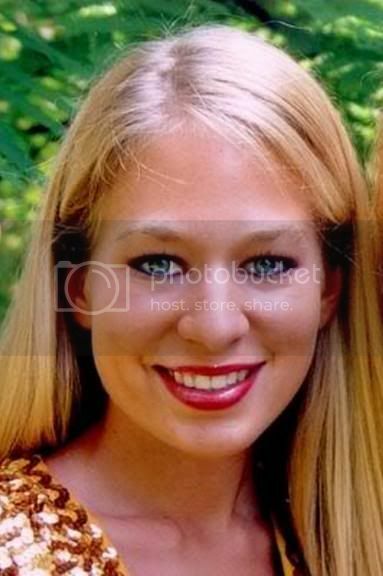 This follow-up to the original movie "Natalee Holloway" closes in on the ongoing mystery of what exactly happened to the Alabama teenager who, in 2005, mysteriously disappeared during her senior class trip to Aruba. Four years after Natalee went missing, Joran van der Sloot, one of the last persons to see her alive, continues to torment her grieving mother Beth by providing false information about Natalee's fate, and continuing to deny any responsibility for what happened to her. 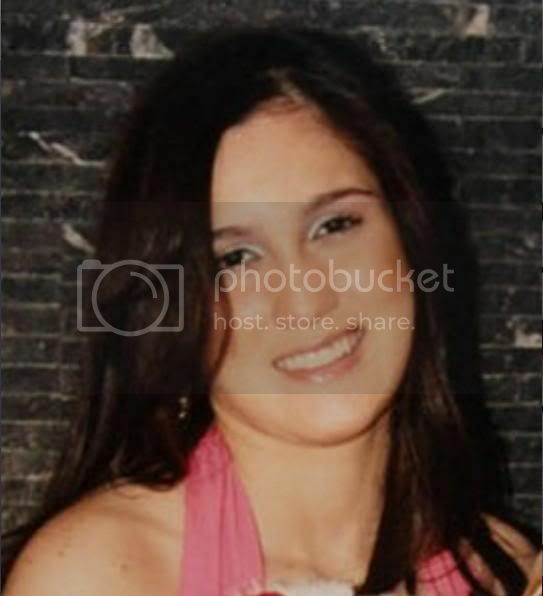 See "Justice for Natalee" photos, cast info, and more. I just watched the Vanished episode that I missed last week about Jessica Lunsford and Tara Grinstead, it was great! It's awesome that Lifetime has put the entire episodes on the web for viewing, they will reach so many more people that way. I'm so proud of Beth! If Mr. Outcry couldn't figure out how to get the job done with access to a CAR... the added step of procuring paint thinner probably is not going to do the trick, either. hELLOOOOOOO, paging Doctor Dumbass at extension 51-50, stat! Me too! Beth is a rock star who does not think she is a rock star... which is my kinda rock star. In my eyes - she is one of the best, and I want her to JUST KEEP ON GOING, for a long time. Whatever she's got - they need to mass produce in vitamin form. I wonder what this is all about? Peter just posted on Twitter. Ach... Joran wil het op een akkoordje gooien... Hij stond er toch zo goed voor, riep zijn advocaat de hele tijd? Of toch niet helemaal? Ah ... Joran wants to make a deal ... He stood so well before, said his lawyer all the time? Or not at all? That has come up many times since his arrest, remember he tried to bargain with the location of Natalee's remains to get back to Aruba, and some of Beth's conversation with him when she went to Castro Castro indicated imo that he was trying to negotiate a deal of some kind. Hopefully more details of what this is all about will come out soon! I've often wondered if they were married, I don't think they are. Seems odd to me that this is acceptable for someone in that position, but maybe I'm just old fashioned. btw...Melony is the daughter of Lienchie Merryweather. "Joran Van der Sloot is a victim of circumstances, " said his lawyer in Peru, Maximum Altez, who said the young Dutchman would not pose any imminent danger of being released. Speaking to News America, however admitted that his client needed psychological treatment to reintegrate into society. As indicated by Van der Sloot asked eligible for early termination of the process, saying a sincere confession of the facts in order to authorize his extradition to the United States for trial in that country. Altez stated that this would avoid costs to the Peruvian State, and allow it to his client a lesser sentence as mandated by the crime of murder. In this regard, said they hoped the sentence given to Van der Sloot is the crime of homicide which would mean a sentence of 20 years. Is that while the defense of Van der Sloot has argued in court that he follows the murder of Stephanie Flores crime by violent emotion, a conviction for murder with a sentence of 20 years it would therefore be one third of the had served the young Dutchman could be free in four to five years. For its part, Aldo Cotroneo, Van der Sloot's lawyer in the United States, said the request for his extradition to that country should be the best federal prison system conditions with respect to the Castro Castro prison where he is. "Compared to the federal prison system in America with what is seen in Castro Castro, the federal prison system is much more advanced, the prisoners have more benefits and is more organized, "he added. Maybe this is what Peter R. DeVries was referring to?